Home / Cat / Cat Scratching Post / Scratch Post For Cats – Made from Seagrass with play ball. Scratch Post For Cats – Made from Seagrass with play ball. This scratch post for cats is 46cm tall, made with seagrass by Basecamp. This scratch post for cats is made by Basecamp. The post is 46cm tall and is made from seagrass. It attaches to a heavy solid anti tipping base. Scratching Post will provide for all your cats scratching needs and keep their nails neat and trim. The scratch for cats features a hanging ball toy and is perfect way to keep your occupied. Your cat is bound to love this post and provides an ideal scratching area to satisfy your cat. Please note these cat posts are bespoke order items and subject to product availability. 1 review for Scratch Post For Cats – Made from Seagrass with play ball. 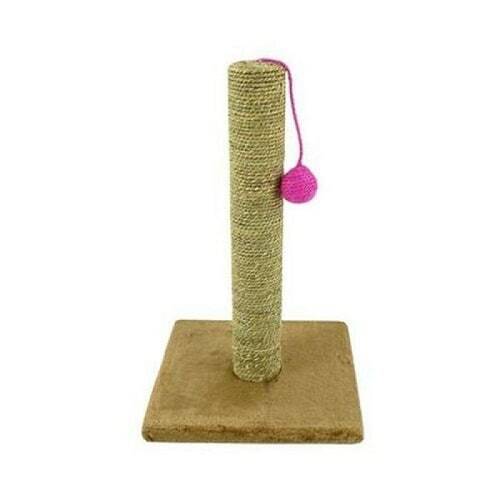 Great scratching post and at a reasonable price. Our kitten was constantly trying to scratch the furniture, but after a bit of persuasion she now loves the scratch post.